the country, we have an impressive track record for quality and educational excellence. To teach Music Tech A-level and with a possibility of teaching on other level 3 music courses. the Disclosure and Barring Service. 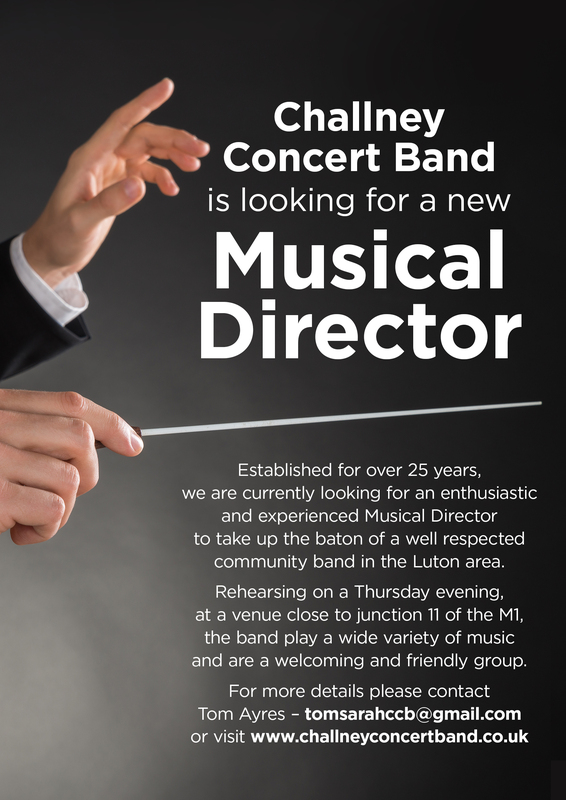 Are you interested in working in music education? 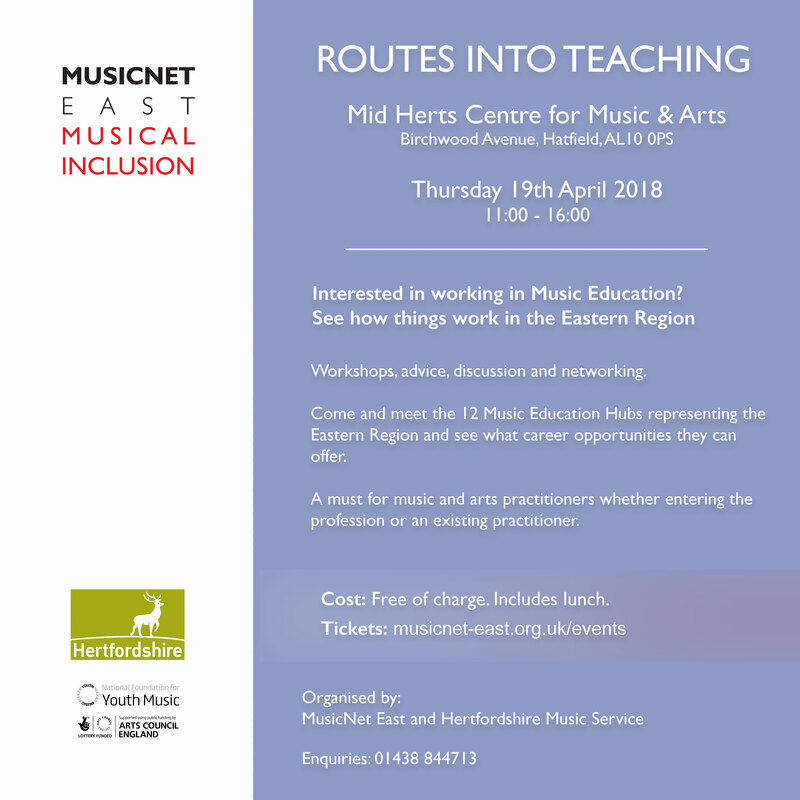 Then, come along and find out more at the Routes into Teaching day on Thursday 19 April 2018 at Mid Herts Centre for Music & Arts. This free event will run from 11:00 until 16:00 and will include workshops, advice, discussion and networking opportunities. 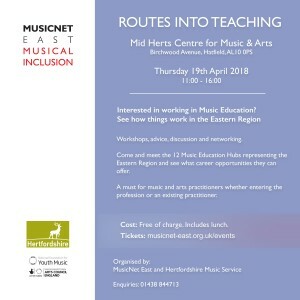 Representatives from the 12 music education hubs that comprise the eastern region will be available to inform delegates as to the career opportunities that they offer. The event is a must for music and arts practitioners, whether entering the profession or an existing practitioner. Following a bid to remain as Luton Music Education Hub’s lead organisation, Luton Music Service has been awarded Arts Council England grant funding for the next two years. This will enable the children and young people of Luton to continue to access affordable, high-quality music provision both in school and at our evening and weekend music centres until at least March 2020. 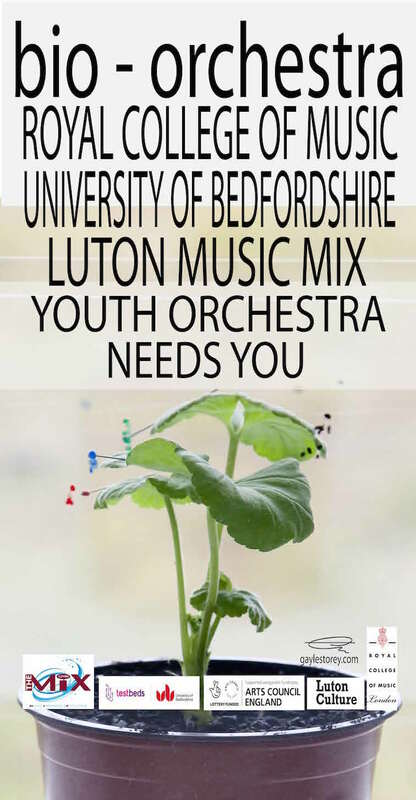 Local artist, Gayle Storey, is collaborating with a composer from the Royal College of Music to produce a bio orchestral score of music from Luton’s environment. The Royal College of Music will be part of a team that will rehearse and perform with students from Luton Music Service. The bio orchestral music will be performed at various venues in Luton and also at the Royal College of Music in London. 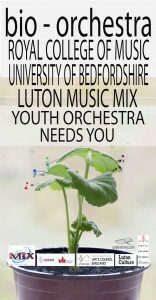 If you are still at school and wish to be part of this unique and original collaboration and play a musical instrument, then contact Luton Music Service on 01582 538224. For more information about the Gayle Storey, visit her website. Don’t miss the Battle of the Bands Showcase on Friday 16 March 2018 at 7pm at UK Centre for Carnival Arts. Bands from Luton’s high schools, Saturday Music Centre and Luton Sixth Form College will perform a range of pop, rock, soul and rock ‘n’ roll music, and a young local DJ will entertain you throughout the evening. Entry is free. Luton Roma Trust and World Beaters Arts and Culture are currently seeking an early years music leader, a choir leader and a percussion leader. The closing date for applications is 19 February 2018. Please read the job description for further information. Luton-based orchestra, Sinfonia Verdi, designed a marvellous continent and culture-spanning project: Roots of Fire, which culminated in concerts in Luton, Leicester and Slough. Children from the UK and India were involved in workshops that led to the creation of a new piece of music that fuses the musical traditions of Indian and western music. Children from Downside Primary School in Luton participated, as did renowned virtuoso sarod player, Amjad Ali Khan. For more information about Sinfonia Verdi, visit their website. 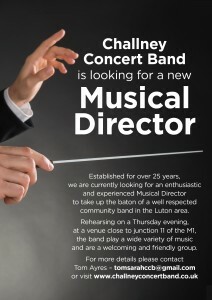 Challney Concert Band is looking for a new Musical Director. Sixty Luton musicians, aged 11 – 18, have been working with inspirational musicians from London-based youth jazz ensemble, Tomorrow’s Warriors, on a project that celebrates the lives of six jazz legends who would have turned 100 this year. Students from Ashcroft High School, Cardinal Newman Catholic School, The Chalks Hills Academy and Luton Sixth Form College formed six bands and participated in workshops in January and February. Each of the six bands explored the music of one of the jazz greats: Tadd Dameron, Ella Fitzgerald, Dizzy Gilliespie, Thelonious Monk, Buddy Rich and Mongo Santamaria. The young musicians have developed both their performance and improvisation skills and are very much looking forward to showcasing specially-arranged sets on Friday (24 March). They will perform in an afternoon concert for schools at UK Centre for Carnival Arts and an evening concert at 7.30pm at Luton Sixth Form College. Tomorrow’s Warriors’ flagship professional ensemble, Nu Civilisation Orchestra, will join the musicians in the second half, bringing this incredible project to a close. If you would like to attend the evening concert on Friday 24 March, please contact Luton Music Service on 01582 538224 or at lutonmusicservice@luton.gov.uk. To learn more about the project, download this document. For further information about the wider Jazz Ticket tour and the project, please visit The Jazz Ticket website. 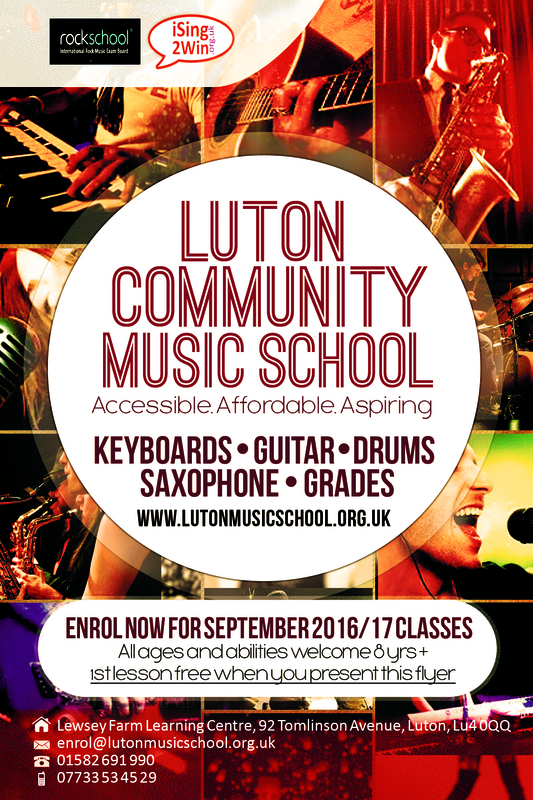 Luton Community Music School currently has space for new drumming students. 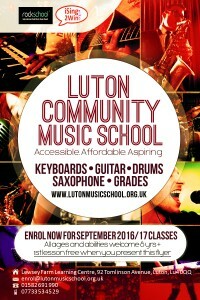 To find out more about the music school ring 01582 691990 or 07733 534529 or visit http://lutonmusicschool.org.uk/.